Fit-Ink: Mayor Rahm Emanuel Finishes the Chicago Triathlon...Again! Mayor Rahm Emanuel Finishes the Chicago Triathlon...Again! Maybe Rahm is somewhere among the sea of swim caps? How did Chicago's mayor, Rahm Emanuel, spend his Sunday morning? Doing the Life Time Tri Chicago. And considering he's not slow--he finished 27th in his age group this year--he was finished with the race before many of us (OK, definitely me) got out of bed. 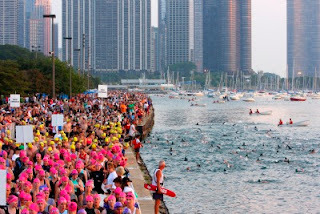 Mayor Emanuel is no stranger to triathlon and endurance sports. His Wikipedia profile says it, he ran the Soldier Field 10 a few years back with his son (I swear Liz mentioned it) and supposedly was at the Ravenswood 5K this past April, and his wife and kids race too though you'll usually find them on the running circuit. He's no stranger to the Chicago Triathlon; he participated last year and finished ninth in his division, and his name is listed in the race results from the Fleet Feet SuperSprint Tri in 2004 and the Chicago Triathlon in 2003. But boy does the mayor's office do a good job--and the Chicago Triathlon race organizers too--of keeping it under wraps. Emanuel stunned many Chicagoans last year, participants included, when news outlets like the Chicago Tribune and the Chicago Sun Times reported his participation in the sprint distance event. But trying to confirm--or even find a clue--that he'd be doing it again this year was like digging for that darn needle in the haystack. You see, I spent half of July--or what felt like it--tracking it down and ending empty-handed though suspecting that he'd be among the 8,500 or so triathletes come August 26. And sure enough, I was right when I checked the results Sunday night. So just how well did our mayor do at the triathlon that celebrated its 30th anniversary yesterday? Better than last year, in conditions that could easily have been deemed just as challenging. Last year, we had nasty winds from the north that slowed swims even for the speedier swimmers (think near rip current-like waves) and made half the bike a challenge, but this year it was humid, windy and even rainy as the morning progressed. Emanuel logged a 17:02 swim (for roughly half a mile), a 43:17 on the bike (22 kilometers), and a 29:07 for a 5K run. His total time was 1:33:46, three minutes faster than the 1:36:50 he posted last year. If there's an award for the most fit mayor, Mayor Emanuel would have to win it. After all, the only other mayor that I can think of that would be in contention is no longer in office: Adrian Fenty, the former mayor of the District of Columbia. And it's almost unfair to make those two face off. There's a 10-year age difference between the two, with Fenty being the younger one. And Fenty grew up around the running scene; his dad, Phil Fenty, is the founding father of Fleet Feet Sports in Adams Morgan, which is now run by big brother Shawn. To see Mayor Emanuel in action, check out this awesome picture posted at the Windy City Sport Fan Club or this slide show of his swim, bike and run (which happens to have been taken by my friend and former Windy City Sports columnist Raymond Britt of runtri.com). Photo courtesy of the Chicago Triathlon. The extent people would go through just to be fit never looked this fun. It's a great thing that the mayor himself is a sterling example of a fit citizen. It just shows that despite his busy schedule, he still looks out for his health. Way to go! Thanks for the comment Kristiina! You're so right...it's amazing that Mayor Emanuel has time to exercise and participate in triathlons with his busy schedule.